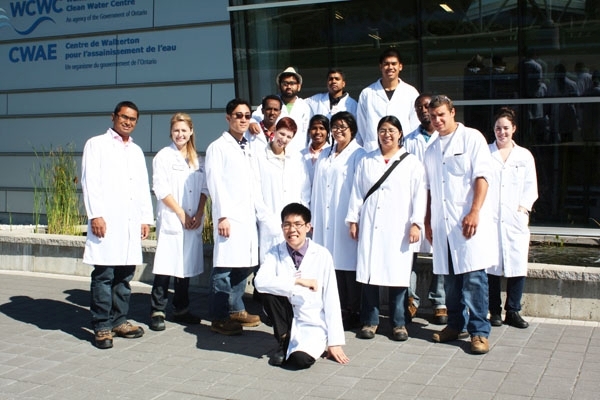 A group of Centennial College Students and Faculty from an August 2013 delivery of the ‘Operation of Conventional Treatment Processes’ course at WCWC. 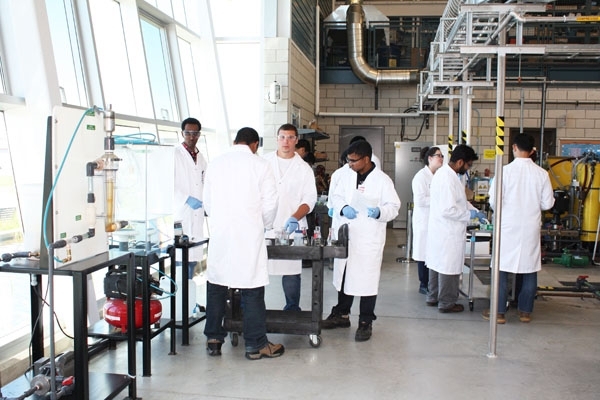 A group of Centennial College students participated in the 3-day Operation of Conventional Treatment Processes course at the Walkerton Clean Water Centre (WCWC) in August 2013. The course provides students with the opportunity to practice hands-on jar test experiments and to operate and monitor a conventional treatment system, including chemical feed setup and backwashing filters. This course is also for drinking water operators and engineers who want to learn about conventional treatment or improve their skills in pilot testing. Prior knowledge of water quality parameters and conventional treatment processes including coagulation, flocculation, sedimentation, filtration and chlorination are a recommended prerequisite. “My Walkerton Clean Water Centre experience has given me a lot of valuable experience regarding the various treatment processes in the water quality industry. The “hands-on” modules and workshops have helped me enhance my knowledge about the industry, resulting in a clearer understanding of the typical operations of a treatment plant, and the duties and responsibilities one may encounter on a day-to-day basis as an operator.” – Ahmed B., Centennial College Environmental Technology Student. The relationship between Centennial College and the WCWC formed in 2007. 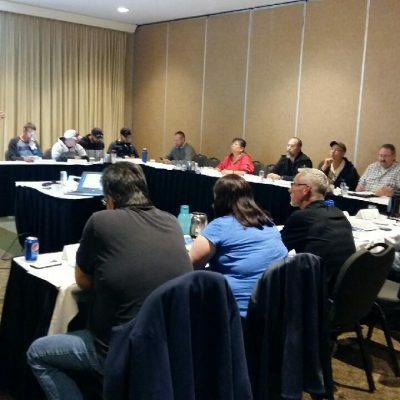 Ontario’s community colleges responded enthusiastically to an invitation by the Ministry of Environment and Climate Change to incorporate the Entry-Level Drinking Water Operator Course (ELC) into their curriculum. It is now part of Centennial College’s Environmental Technician and Technology Programs. Each college’s participation allows the training to be more accessible to students, which are the new generation of water operators. Drinking water operators require additional education or training beyond Grade 12. The decision for Ontario colleges to offer the ELC was a well-planned strategy for a longer term, progressive Ontario drinking water industry. Students work in WCWC’s Technology Demonstration Facility during the Operation of Conventional Treatment Processes course at WCWC in August 2013. “The collaborative effort of the Ministry of Environment and Climate Change, the WCWC and Ontario’s community colleges like Centennial will help to ensure that training courses are available and accessible throughout the province. It will ensure that the province will have the knowledgeable and conscientious people needed to safeguard Ontario’s drinking water and keep it among the best protected in the world.” – Michael Gauthier and Connie Zehr, Professors, Applied Biological and Environmental Science, School of Engineering Technology and Applied Science, Centennial College. • In 2007, Centennial College signed an agreement with the Ministry of Environment and Climate Change to deliver their mandatory ELC as part of the Environmental Technician program. This partnership came into effect at a Train-the-Trainer session at WCWC in June 2007. • Centennial students with the highest grades in the Environmental Program have been given the opportunity to receive special training at the Walkerton Clean Water Centre’s Technology Demonstration Facility. As of January 2013, 92 Centennial College students have benefited from this opportunity, which is financially supported by WCWC and Centennial College. • As of September 2013, 302 Centennial College students have graduated from the ELC self-study and classroom examinations. • Since 2007, Centennial College faculty and students have enjoyed attending a variety of positive offerings at the WCWC. 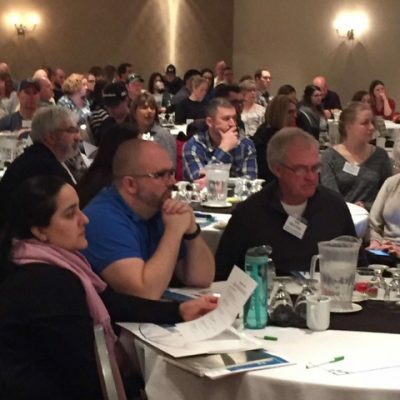 Some highlights have included Maintenancefest, industry forums with guest speakers such as Gord Miller, Environmental Commissioner of Ontario and other drinking water education sessions. Still Time to Register for Maintenancefest Walkerton – 6 New Modules this Year!